Jupiter Hospital (Baner-Pimple Nilkh road, Baner. Pune-45) is organizing free consultation by MD Physician. To support you in your hour of need for medical advice, we have arranged for doctors on every Sunday whom you may consult absolutely free. From the following day you can continue to visit your doctor for further consultation. The Sunday OPD is our way of giving back to the community with the best in medical advice and care. Annapurna Pariwar made new schemes in their credit society for giving more better and wealthy life to their members. During 2017, Annapurna Group gave micro loans of around Rs.150 crores to the poor women and collected savings to the tune of Rs. 40 crores. Annapurna group gives loans without any collateral or security and yet the repayment rate is 100%. The repayment was not adversely affected even during the difficult period of recent demonetization. 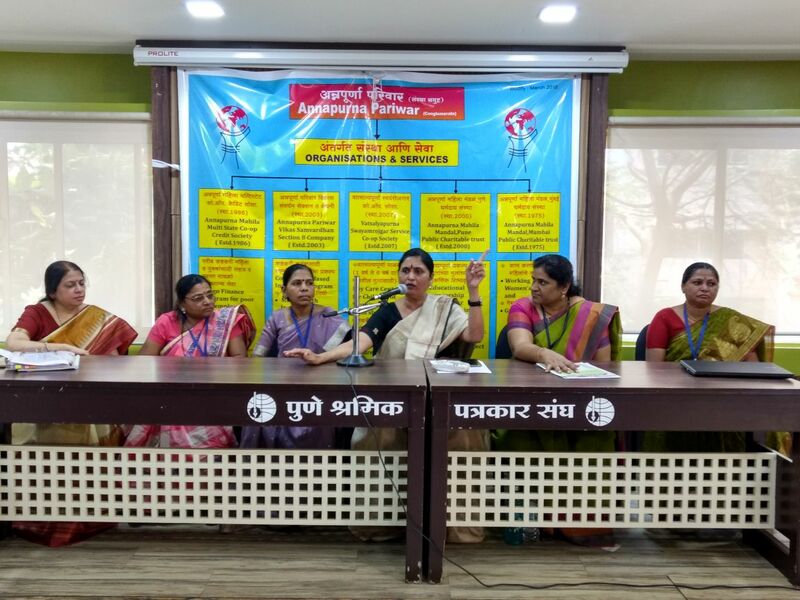 Annapurna Pariwar is a group of 5 Developmental Organizations working in Pune and Mumbai with an aim of empowering poor women and their families in terms of finance, education, health and child development. At the press conference Dr. Medha Purao-Samant, Founder Chairperson of Annapurna mentioned that “beginning next year Annapurna will be moving towards cashless transactions with members as their bank accounts have now been opened with great efforts. Loans ranging from Rs.30,000 to Rs.2 lakhs will be given without any collateral. Health insurance claims benefit shall range from Rs.20,000 to Rs.35,000. She also appealed to them to enroll themselves in the Adharpurna scheme brought to them by Annapurna and to take loans only if necessary”. The financial year 2017-18 was a turbulent year due to two major decisions of the Government of India –One –Demonetisation & the other – Implementation of GST. The Microfinance industry which caters to the credit needs of the poor in our country suffered a major blow during 2017-18. The NPA of the Banking sector has also grown in the past few years. But the NPA of Micro Finance industry which was under 2% consistently for last 5 years rose to 9% at the national level & 20% at the Maharashtra State level. In such a scenario, Annapurna Pariwar has done extremely well. Annapurna Pariwar not only provides credit facilities without any collateral security / guarantee to the poor but provides a comprehensive financial package of credit, savings, Health & Life & Family insurance & old-age savings and also provides non-financial services like Day Care Centers for children & client education, Financial Literacy Training etc. Annapurna Pariwar disbursed Rs.150 crores in the year 2017-18 to its members, who are also the shareholders of AMCCSL. The NPA (PAR) is under control at 1% which is much lower than the Microfinance Industry. Annapurna Pariwar collected voluntary savings from its members - the amount rose from Rs.33 crores to Rs.40 crores in 2017-18. Annapurna Pariwar disbursed Health Claims for the sickness of its members & their family members to the tune of Rs.91 lakhs in 2017-18. This is a unique facility which no other Micro finance industry offers. Micro Insurance in India is still not reaching out the poor & needy families suffering from health problems. Annapurna Pariwar disbursed to the members Death claims & their family members to the tune of Rs.35 lakhs (LMF + FMF) in 2017-18. With all the financial services Annapurna Pariwar has sailed through the rough waters in the past year. In the year 2018-19 Annapurna Pariwar plans to extend a better package of credit, saving, Health & Life insurance. The loan size will be higher with a reduced interest rate. The Health insurance amount will be much higher than the previous years. Annapurna Pariwar made new schemes in their credit society for giving more better and wealthy life to their members. They increased loan amount and also giving higher ROI on FD’s. We look forward to servicing our members who are poor self-employed women & thus achieve our goal of Empowerment of Poor Women by upholding our sustainable yet not profit oriented model of Comprehensive Development. The Master of The Art of Living, Gurudev Sri Sri Ravi Shankar will visit Pune, Satara, and Ahmednagar from 13th to 15th March. Gurudev will interact with the attendee’s on 13th March between 6pm to 8pm at VITS Hotel, Bibwewadi. A well-known singer of the Art of Living Shri. Vikram Hazara will perform in presence of Gurudev Sri Sri Ravi Shankarji on 15th March, also a ‘ShivSanjivani Mahasatsang’ will be held at Bharti Vidyapeetha Ground, Katraj. Gurudev Sri Sri Ravi Shankar is a noted spiritual leader, multidimensional humanists. His dream of creating a violence free world has inspired millions of people in the world. Serving and establishing peace in the world through interaction, Sri Sri is a fundamental form of non-violence and universal human values. Work by Sri Sri is beyond caste, religion and nation, that is the reason why millions of people come for internal peace and guidance. He have always emphasized and focused on need of raising human values through his various activities and speeches and beyond all this our identity as a person is most important than nation, gender, religion. They have always been trying to make world free of violence by increasing intercaste reconciliation, increase peace in the world, and reduce the gap between castes and exchanging different cultures to lessen fanaticism. Gurudev Sri Sri Ravi Shankar has a dream to set up the world’s largest college in the world, giving world-class teachers, Sri Sri University, Odisha, is a small but concrete step in this direction. Thousands of students are now studying in such special addiction free environments. We are proud to contribute to Sri Sri Ravi Shankar’s dream about world-class education. The Maharashtra Art of Living desire to donate a hostel building to Sri Sri University. This place will be known as ‘Chhatrapati Shivaji Maharaj Bhavan’. The building will have a total of 138 rooms and the construction is 74,500 Sq. ft. and it can accommodate 400 students. This edifice will also include a museum that tells the history of Maharashtra and Chhatrapati Shivaji Maharaj.